Continuing with its assault on the solid-state drive market OCZ has announced the latest additions to its Agility and Solid family of products. Like the Vertex 3, the new drives support SATA 6Gbps connectivity and are powered by a SandForce SF-2200 controller, but unlike their more expensive sibling the Agility 3 and Solid 3 are designed to cater budget-minded users in search of the best value for performance. 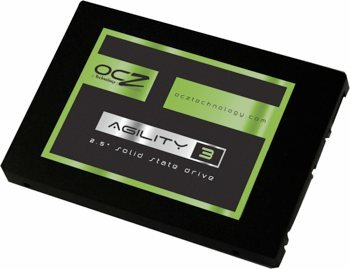 OCZ claims that the Agility 3 can deliver up to 525MB/s read speeds, 500MB/s write speeds, and up to 60,000 4KB random-write IOPS. That's a massive improvement over its predecessor, which achieved up to 285MB/s read and 275MB/s write speeds, and 10,000 4KB random-write IOPS. Meanwhile, the new Solid 3 SSD offers a remarkable 500MB/s and 450MBps, respectively for read and write speeds, as well as 20,000 4KB random-write IOPS. The company's announcement says the drives will be available in a new boot-drive size 60GB capacity as well as 120GB and 240GB options, with all of them featuring TRIM support to optimize performance over the drive's lifespan. There's no mention of price in the press release but Cnet reckons that the Agility 3 will cost $135, $240, and $480 depending oncapacity, while the Solid 3 is either $130 or $230 for the 60GB or 120GB model. They will all be available for purchase later this week backed by OCZ's 3-year warranty.